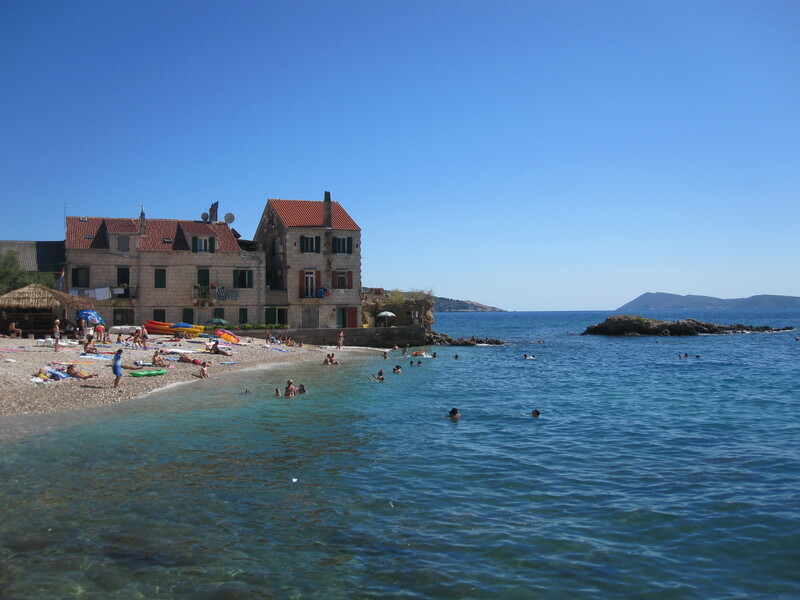 The next morning we followed what we hoped were locals to a nearby rocky cove, and passed the better part of the morning swimming and sampling the local lemony beer, Ožujsko. 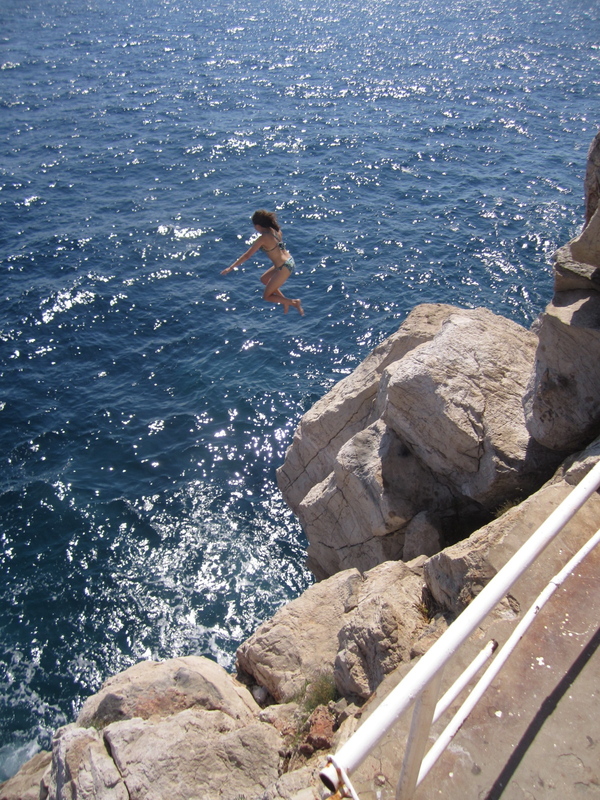 After a light lunch, we moved over to Cafe Buža on the city walls to do some cliff jumping. I’m terrible at guessing how tall things are, but the first jump felt big to me, definitely bigger/ rockier than any high dive, and I was pretty proud of myself, until I saw someone jump off from the rocks a level above mine. I couldn’t quite muster up enough courage to do it, which I kind of regret, but then again not really, because I would regret no longer being alive more. Once we got tired of risking our lives, we took a sunset stroll around the city walls, and got the bonus of a surprise glut work out from the many stairs. Totally worth it for the gorgeous views of the harbor and red tiled roofs of the city. We were sore the next day for our much longer than expected bus/ferry/different bus ride to the town of Vela Luka on the island of Korčula. It was a really beautiful island, but unless you’re a scuba diver, you could probably skip Vela Luka and hang out somewhere else. 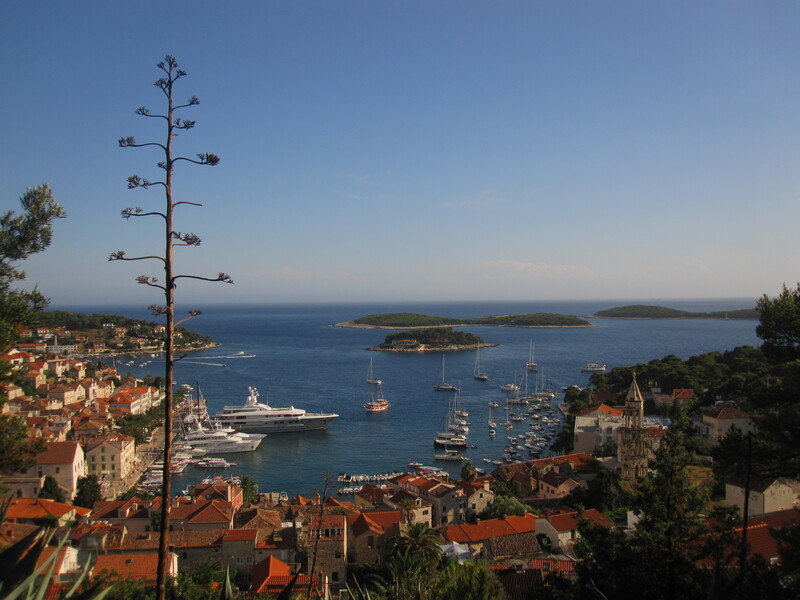 We enjoyed our lunch and hike, and went to bed early, since we had another 4:30am wake up to get to the island of Hvar. Our ferry arrived at 6am, and we stumbled onto the dock still sleepy and in our pj’s, prepared to sit quietly at a cafe for a bit and have a coffee while we waited for our hostel to open. We quickly realized that despite our bedraggled state, Hvar was still on and poppin’, as throngs of beautifully dressed and very intoxicated Europeans continued chatting on the streets while slowly making their ways back home. It was either that moment, or when I saw the rows of luxury yachts, one large enough to have its own personal helicopter, when I realized that I was waaay out of my element in Hvar. I couldn’t hang, and even if I had wanted to, I couldn’t have afforded it. 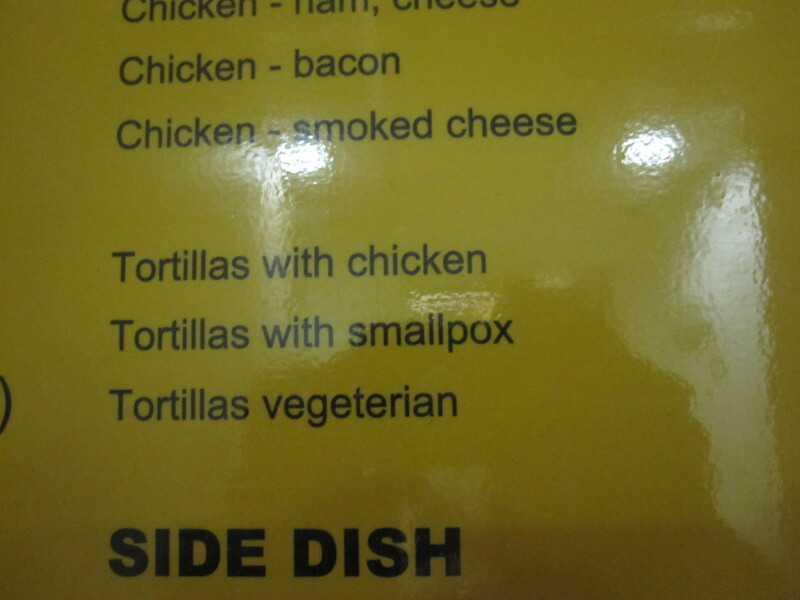 Much to the dismay of our new hostel friends, we only really went out for one late night. What I enjoyed most over our three nights there was the people watching, our little hike up to the fort for a view of the harbor and city, the freak rainstorms that would come suddenly and with an intensity like I’d never seen, only to disappear and be forgotten minutes later as the party continued on, and our day excursion to the Green and Blue Caves/ the island of Vis. After lounging on the deck for our two hour boat ride out, we were able to jump from the second level into the water and swim to the first cave. The Green Cave was lit from little holes in the rock above, making patches of the water we swam in appear almost an olive color. We continued onto the Blue Cave, where after a lunch of tuna steaks (tastes just as good as tuna from a can, who knew?) and plenty of white wine, we were rowed in little dingys over to the opening. We were told to duck our heads, and after we squeezed through we found ourselves in a complete darkness, with the only light coming from the iridescent glowing blue water all around us. It was pretty magical. From there we had a couple hours on Vis to relax and swim, but since we were all feeling crispy after too much time on the deck, we passed our time in the shade eating ice cream and lounging. Our last stop was in Split, which was easily my favorite place. 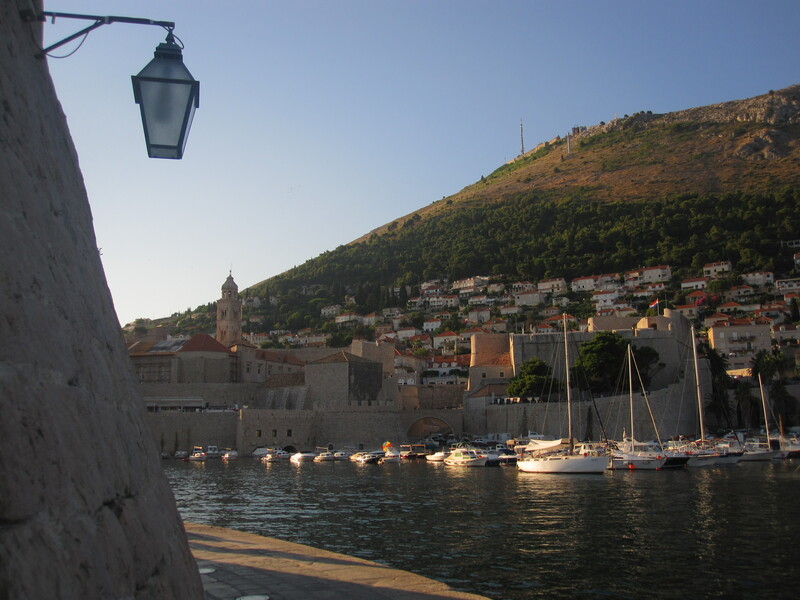 The city itself was similar to Dubrovnik, except a little grittier and without all those ridiculous steps. I loved the statues and artwork put up along the boardwalk, and while the beaches weren’t as nice, it felt more authentic. I finally saw/ conversed with actual Croatians, whereas everywhere else felt very saturated with tourists. The old city was amazing, I loved winding through the narrow alleyways and ducking under archways to discover hidden treasures, plazas and cafes. 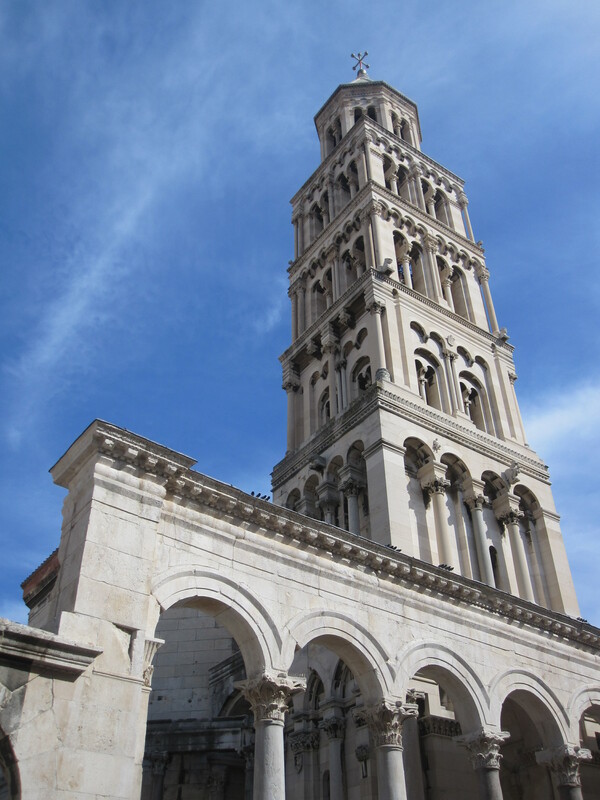 The first day we got happily lost in the old city, and climbed up the bell tower for a 360 view of Split. 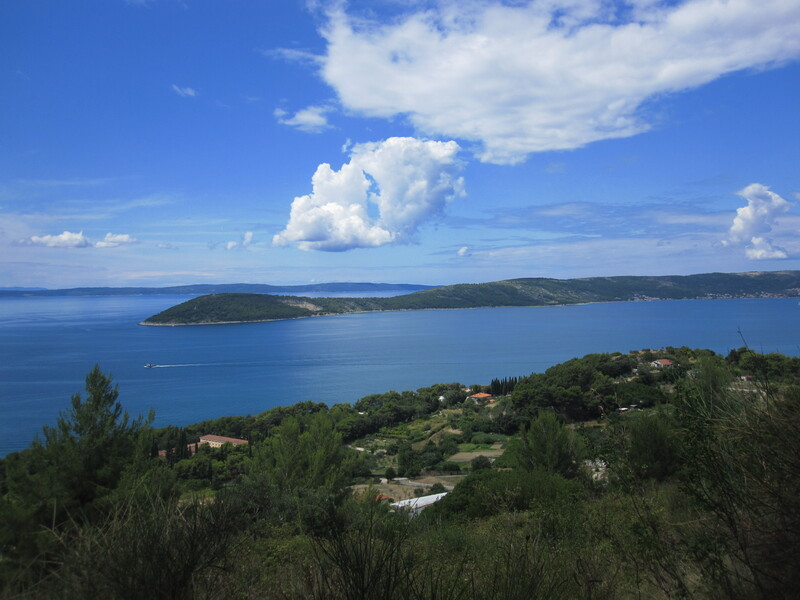 The next day we spent hiking around the Marjan, a giant plateau next to the old city with incredible ocean views. By happy accident we ended up on an old pilgrimage trail, so from time to time we would stumble upon these hermitages carved into cliff walls that monks used to meditate in, and old boarded up churches with thousands of prayers written on the sides. Sadly, after only two nights it was time to slowly start making our way back to Madrid. On our bus ride back to Dubrovnik we made a surprise pit stop in Bosnia, and the next day we had an early morning flight, followed by a 10 hour layover in Rome. We saw almost all the main tourist sights, I re-visited my love affair with the the Jewish-style artichokes at Nonna Betta, and of course I made sure to throw a penny in the Trevi Fountain to ensure my return. Our flight back out of Rome was delayed and after all that travel and early mornings, I was exhausted. I’ve had a few days in Madrid before my 13 hour flight home, and thanks to my father I’ve spent them taking advantage of the buffet breakfast and lounging by the pool at the Hilton, going out in style. I’m sad to see this chapter of my life end, it was a fun one. Other than looking forward to a weekend with my favorite gauchos and a week in the Big Apple, I don’t have any real concrete plans for life post-Madrid. But, I have a lot of ideas, and I feel okay, daresay even optimistic, about whatever the future might bring.